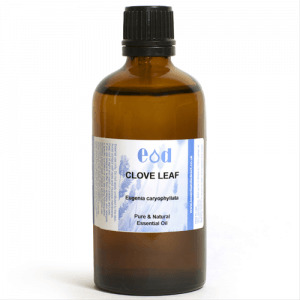 100% Pure and Natural Clove Leaf Essential Oil - Suitable for use in aromatherapy blends, candle manuacture or inclusion in cosmetics subect to approved safety levels. We offer this oil in a variety of sizes supplied in either amber glass tamper evident dropper bottles or aluminium tins depending on the size. All oils supplied have a best before date and batch number for full traceability. Reputed actions: Strengthening, rejuvenating, calming, toning. Making your own skin products or manufacturing candles? We can provide data such as CofA, allergens, IFRA statement available on request. Or visit our SDS LIBRARY for Health & Safety information. Eugenia Caroyphyllus Leaf Oil is an essential oil steam-distilled from the leaves of the Clove, Eugenia caryophyllus, Myrtaceae.